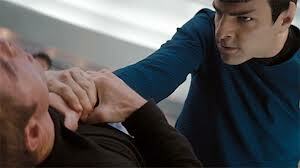 Don’t worry readers, the review for the new Star Trek Into Darkness is coming right up. But first, let’s look at its predecessor, the eleventh Star Trek film. After Star Trek: Nemesis became a box office failure in 2002 and the series Star Trek: Enterprise was canceled in 2005, the franchise seemed to have died. Paramount Studios realized they ran Star Trek into the ground and so it went on hiatus. The fortieth anniversary of the original TV show came and went without any fanfare and implied that no one cared about Star Trek anymore. However, J.J. Abrams, the man behind the classic TV show Lost, was brought in to rejuvenate the franchise. It was decided to bring Star Trek back as a film series rather than a TV show and so Abrams and his team rebooted the franchise, resulting in the 2009 feature film Star Trek that went back to the beginning. The film was a rousing success but sparked controversy among stalwart fans. Star Trek begins with a dizzying, close up shot of the starship Kelvin gliding past the camera as it investigates a lightning storm in space. This storm turns into a black hole and from it emerges a gigantic spaceship shaped somewhat like a squid with sharp mechanical tendrils. This ship immediately opens fire on the Kelvin with advanced weaponry. The Kelvin isn’t a match but puts up a gallant fight. The attackers demand that the Kelvin’s captain, Robau (Farin Tahir), go to their ship to discuss a surrender. Right away these scenes signaled that Star Trek was reinvigorated with wild, kinetic battle scenes. Robau leaves First Officer George Kirk (Chris Hemsworth) in command and is killed in the enemy ship by its crew, a group of bald, tattooed Romulans. Kirk orders a shipwide evacuation and covers it by setting the Kelvin on a collision course with the attacking ship. One of the evacuees is his pregnant wife Winona (Jennifer Morrison), who goes into labor in an escaping shuttlecraft. Kirk is unable to join her because he has to manually fly the Kelvin into the enemy ship. He is able, however, to hear the first cries of his newborn son James Tiberius Kirk moments before the Kelvin smashes into the Romulan ship. Years later, Kirk’s son grows up to be a rebellious, angry young man (Chris Pine) without any direction in life and living in Iowa by a shipyard that is constructing the Enterprise. 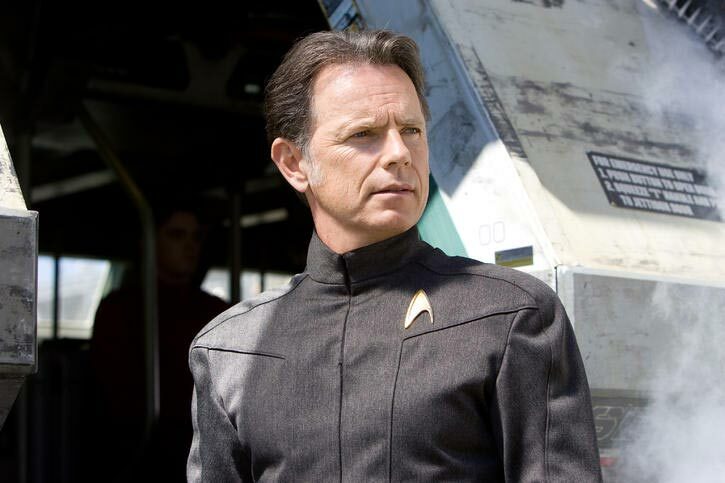 After a bar fight, he meets Captain Christopher Pike (Bruce Greenwood), who sees some potential in James Kirk. Pike is able to convince the young man to join Starfleet. During his training Kirk meets many people who will become important parts of his life, notably Dr. Leonard “Bones” McCoy (Karl Urban) and Spock (Zachary Quinto). Ironically, Kirk and Spock do not get along at first. Spock is a by-the-book officer who cannot abide Kirk’s brash and reckless demeanor. Things come to a head after Kirk takes the Kobayashi Maru simulator test, which Spock developed to train cadets, and is caught cheating. Kirk is under inquiry for his actions when fate intervenes. Starfleet receives an emergency distress call from the planet Vulcan and all available ships on Earth are dispatched. Among them is the new U.S.S. Enterprise commanded by Pike with Spock as its first officer. With McCoy’s help, Kirk is able to get onboard the Enterprise as it joins the armada. The ship is unable to jump into warp space with the other ships thanks to an error made by the helmsman Hikaru Sulu (John Cho ). It turns out that this delay and Kirk learning of a lightning storm reported by Vulcan helps saves the ship. Kirk guesses that the Enterprise will be facing the same fate as the Kelvin and tells Pike. When the time the Enterprise drops out of warp space near Vulcan, the crew finds a floating junkyard of destroyed ship parts. The other Starfleet ships were easily destroyed by the same Romulan ship that destroyed the Kelvin. The ship had launched a long, tethered drilling platform to Vulcan’s surface. When the Enterprise is discovered, the Romulan ship’s commander, Nero (Eric Bana), orders an attack on the Starfleet vessel but stops when he realizes it’s the Enterprise. The Romulan demands that Pike go to his ship just as was done with Robau. Pike agrees, but before leaving, he promotes Kirk to first officer and leaves command of the Enterprise to Spock. He has Kirk, Sulu and a redshirt accompany him in Pike’s shuttlecraft. Before Pike turns himself in, the trio are clandestinely launched via parachutes to the drilling platform to disable it. After fighting off Romulans on the platform, Kirk and Sulu are able to disable it. But they’re too late, the drill already reached the planet’s core. The Romulans release a substance called red matter that creates a black hole in Vulcan’s core, dooming the world. In a desperate move, Spock beams down to Vulcan just in time to save his father Sarek (Ben Cross) and a few others but not his mother (Winona Ryder). Shortly after, he and the handful of survivors are beamed back to the Enterprise as Vulcan is destroyed from within. Spock struggles not displaying emotions over the death of his mother and world and Pike’s capture. He decides to regroup with the fleet but Kirk tries to convince him otherwise. The Romulans are heading to Earth and Kirk demands that they try to stop them. After they argue for several minutes, Spock has Kirk removed from the bridge and ejected from an escape capsule to a nearby planet, Delta Vega, and orders the Enterprise to resume its course to rendezvous with the fleet. After the capsule lands, Kirk breaks out and finds himself in a frozen world filled with predatory animals out to snack on him. 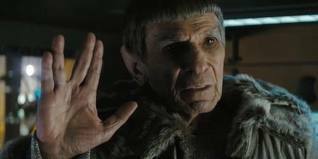 He is saved from one huge animal by a mysterious Vulcan who turns out to be a very old Spock (Leonard Nimoy). This Spock mind melds with Kirk and he learns that Spock is from the future as are the bald Romulans. In the late 24th century, the Romulans’ homeworld was destroyed by a supernova that threatened other worlds. From his own ship, Spock launched a sample of the red matter to destroy the supernova by creating a black hole. As he tried to escape the black hole, he encountered Nero and his ship. The Romulan was enraged at Spock because the Vulcan promised the Romulans he would save their world, now his wife and family are dead. Before anything could happen, Nero and Spock’s ships fell into the black hole, which was a doorway to the past. Nero had Spock abandoned on Delta Vega so that he could witness the destruction of Vulcan and experience the pain that Nero felt in the future. The elder Spock realizes that history has been altered by Nero’s interventions since Kirk’s father originally lived to see Kirk take command of the Enterprise. They reach a remote starbase on the planet and meet Montgomery “Scotty” Scott (Simon Pegg), who has the means to beam Kirk back to the Enterprise. Spock tells Kirk that he must go back to the Enterprise and relieve his younger self of command and stop Nero. This isn’t your father’s Star Trek. It’s loud, flashy, energetic and visually striking. The production team behind this film should be rightfully applauded for re-imagining the 23rd century and making it look uber-futuristic, while keeping things realistic. Unlike the previous incarnations, we see intricate tubing, wires, dials and other controls throughout the Enterprise. The ship’s interior is flooded with bright display screens and strong lights, including J.J. Abrams’ signature lens flares. The overall design looks like Apple technology run amok but is visually pleasing. It provokes the nostalgia for the original TV show (thanks to similar sounding sound effects), while showing a very plausible looking version of Starfleet. This was something the more modern Star Treks couldn’t accomplish. Yes, the look in those films were futuristic but lots of times it seemed banal and too lofty, though some films and TV shows tried to look more identifiable. 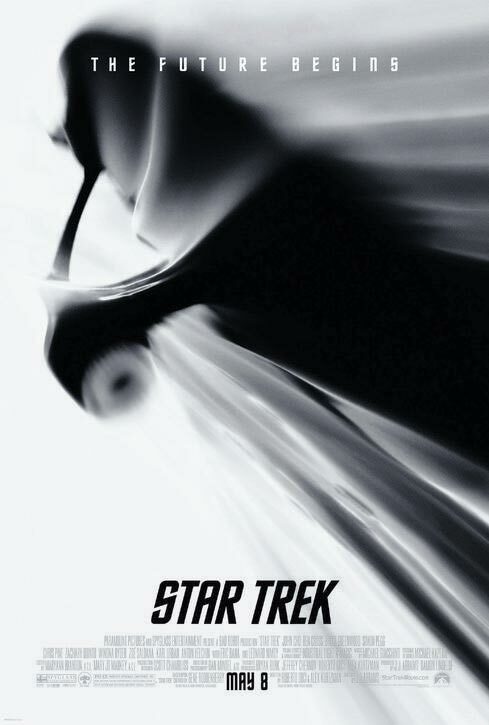 Getting back to Star Trek, production-wise, the film jolted the franchise and set it on fire. Everything was top-notch, from the makeup (which won an Oscar) to the busy and detailed set designs to the excellent special effects (it might’ve won the Oscar but Avatar came along that year). 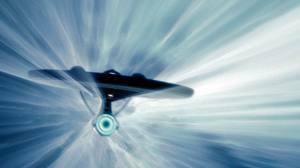 From a visual standpoint, Star Trek is simply spectacular. From a story and character perspective…well that’s another matter. The characters represent a mixed bag. Some actors did spot-on impressions of the original actors and their characters. This especially applied to Karl Urban, the man looked, spoke and behaved just like the late DeForest Kelley. It’s as if they somehow resurrected that actor, it was so amazing. But some actors just missed the mark either with not looking like the original actors or going overboard with accents. As the lead, Chris Pine had a heavy burden and did his best. Nothing against him, he did a good acting job but he didn’t feel like the original Kirk. He didn’t sound anything at all like William Shatner and lacked his mannerisms and speech patterns. But that’s not a deal killer. What is detrimental is that he wasn’t as personable as Shatner’s Kirk. This new Kirk came off as cocky, arrogant and not at all identifiable. He seemed more like the dumb jock who would pick on nerds and slide through life based on his good looks and charisma. It was hard to feel for him, but perhaps that is due to the altered timeline that changed his personality. The acting was overall fine, but the notable actors were Greenwood, who looked and acted like a genuine starship captain, and Tahir and Hemsworth, who made the most of their limited screen time and left powerful impressions. Bana’s Nero was a very good villain, although not too original. A crazed madman blinded by vengeance, seen that before, but he does it very well and projects a sense of being dangerously unpredictable. With this reboot, Abrams and company tried to have it both ways and that wasn’t necessary. Instead of a straight on remake/reboot they played it cute and stated in interviews that we’re seeing an altered timeline and that the original Star Trek all the way up to Star Trek: The Next Generation still exists. Well that isn’t the way time travel works in Star Trek. In most stories dealing with time travel, whenever a character goes to the past and changes it, the future is changed. Look at “City On The Edge Of Forever”, “Past Tense”, or even Star Trek: First Contact to see what I mean. While it was good seeing Nimoy reprising his role, it was frustrating to see his Spock placidly accepting his fate. He doesn’t seem to want to return to the future or restore the timeline. Does that mean, this film takes place in a parallel universe? It’s never clear, there should have been a clear indicator that the original timeline still exists to at least calm some fans. Other fans also argued that this film is too fast and all style and no substance. Some have compared it to a Star Wars film and those complaints have validity. But truthfully, the franchise needed to do something that worked, that would get non-fans to fork over money to see this in theaters. On that count, Abrams succeeded, but the result alienated many fans. That will be detrimental in the long run. Of course, new fans are needed to replenish and grow the fan base but Star Trek can’t forget what it was supposed to be about. Exploring the unknown, meeting new races, scientific curiosity, allegories and moral lessons. Gene Roddenberry often complained about the films when he was alive. Those are faithful interpretations to his peaceful visions when compared to this one. Roddenberry would’ve been aghast to see Star Trek morphed into a popcorn flick. I’m not saying Star Trek is a bad movie. No, on the contrary it’s exciting and fun, but it lacks that special feeling. The first half of the film was nearly perfect because it explored the origins of these characters and they were diamonds in the rough, so any variations were forgivable. But by the second half of the film, it felt off thanks to its plot and character developments, especially with Kirk. The ending where he is given command of the Enterprise also doesn’t seem realistic. Okay, he saved the Earth but would he really be given command of a flagship? Nope, the top brass would’ve probably promoted him to a first officer and told him to do some more learning and earn a captaincy. There are some major flaws with the plot, like the just-mentioned time travel nonsense. A nagging theme running throughout is the incredible conveniences that place the original Enterprise crew together. It seemed as if everyone just happened to be filling in for the regular assigned crewmembers when the calamities began. It didn’t feel organic nor credible, except for McCoy’s comical efforts to get Kirk onboard the ship. Still it’s an admirable effort. Star Trek may not be perfect but it’s a lot of fun to watch and has more life than many of the previous films.